Are you concerned with something on your skin and want to find out what it is and how to treat it? Our Skin Diagnosis & Reference Guide is here to help you. Choose your skin concern from the list below to learn more about that particular skin condition and its treatments. If you don't see what you're looking for, call Colorado Skin & Vein at 303-683-3235 to schedule an appointment with our board-certified dermatologist. Acne is a skin condition that can appear in the form of whiteheads, blackheads, and pimples. It usually develops during adolescence and may continue into adulthood due to hormones that increase oil production. The overproduction of this oil (sebum) can trap bacteria in the glands and cause acne. Because of this, acne tends to affect areas with a high number of oil glands, such as the face, upper chest, and back. After microdermabrasion treatment is performed or the skin is cleansed with acetone, the topical chemical LEVULAN® (5-aminolevulinic acid or 5-ALA) is applied to the skin to make skin cells sensitive to certain wavelengths of light. In one to three hours, the LEVULAN® is washed off, and then the skin is treated with either Intense Pulse Light or the Pulsed Dye Laser. Isotretinoin is a type of retinoid medication that treats severe cystic acne by decreasing the production of facial oil (sebum) that causes acne. Women who are pregnant or are trying to get pregnant should not use isotretinoin. We offer a range of topical treatments to treat a wide variety of acne. Whether you suffer from comedonal, hormonal, inflammatory, or severe cystic acne, we can help determine the right treatment for you. One or more treatments can be combined for optimal results. A chemical solution is applied to the face that removes the damaged outer layers of skin. This treatment results in improved skin texture tone for an overall healthier complexion. We offer topical ACZONE® (dapsone), clindamycin, and erythromycin antibiotics to treat severe acne. These treatments improve acne by reducing inflammation and killing the bacteria that causes acne. We offer spironolactone, oral contraceptives, and topical retinoids and/or antibiotics to treat acne that is caused or worsened by hormone fluctuations. 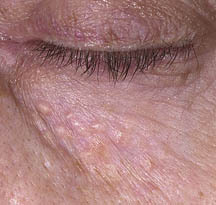 Actinic keratosis is characterized by a persistent small (2 to 6 mm in diameter) rough spot or red, pink, or brown plaque. 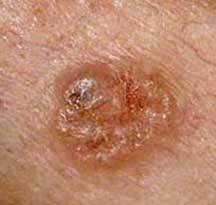 These lesions are usually dry or scaly and surrounded by broken blood vessels and brown spots. AK is precancerous and caused by UVB damage, and about 10% will develop into cancer in just a two-year period. 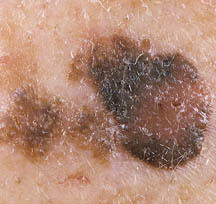 Patients over the age of 40 may notice that their actinic keratosis patches bleed on occasion. Also known as cryosurgery, cryotherapy is a quick and minimally invasive procedure that uses liquid nitrogen to freeze and destroy abnormal or diseased tissue. As the small, handheld canister delivers the liquid nitrogen to the lesion in several short bursts, ice crystals form inside the cells to cause their destruction while also cutting off their blood supply. Known as Active FX or Deep FX, CO₂ Fractional skin resurfacing uses laser energy to create microscopic wounds in the damaged skin while leaving “bridges” of healthy skin. This results in the production of new collagen and protective tissue, and the remaining healthy skin aids in the healing process. We offer a range of topical treatments, including Picato®, 5-Fluorouracil (Efudex® and Carac®), and Aldera™, to treat actinic keratosis, and we can help determine the right treatment for you. One or more treatments can be combined for optimal results. 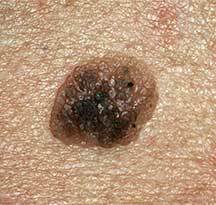 BCC is the most common form of skin cancer and develops within the deepest layer of the skin, the basal cell layer. It usually grows slowly and looks like an open sore, red patch, or shiny or pink growth. The abnormal growth is surgically removed. 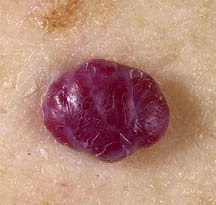 A skin-sparing procedure in which small margin of tissue is taken around the lesion. This tissue is frozen and examined under the microscope to ensure clear margins before closing the incision. A series of careful scrapings and electrical pulses are applied to the growth to destroy the abnormal tissue. We offer a range of topical treatments, including Aldera™ and 5-Fluorouracil (Efudex® and Carac®), to treat basal cell carcinoma, and we can help determine the right treatment for you. One or more treatments can be combined for optimal results. 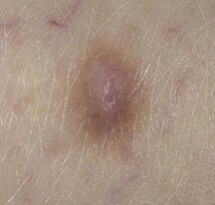 What Is a Becker’s Nevus? 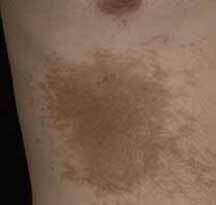 Becker’s nevus is a benign, well-circumscribed, pigmented skin lesion that predominantly affects men. The nevi generally appear on the torso or upper arm and gradually enlarge irregularly, and they may become thick and hairy. The Q-switched laser produces extremely high-powered pulses of light to break apart pigment in the skin. When the laser is applied to the skin, the melanin in the hair follicles absorbs the laser energy. The laser energy heats and damages the follicles, preventing them from producing hair. A series of careful scraping and electrical pulses are applied to the growth to destroy the abnormal tissue. We offer a range of topical treatments for early stage squamous cell carcinoma caused by sun exposure, and we can help determine the right treatment for you. One or more treatments can be combined for optimal results. 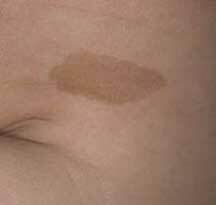 Cafe-au-lait spots are light brown birthmarks that are not usually associated with medical problems. However, having 3 or more cafe-au-lait spots is linked with neurofibromatosis and the rare McCune-Albright syndrome. Commonly referred to as PhotoFacial (or FotoFacial), IPL is a gentle, non-ablative treatment that uses broad spectrum light to remove pigmented lesions (dark spots) and redness from the skin. During the procedure, light energy is absorbed by the pigment, which causes it to break apart and diffuse. Also known as cherry hemangiomas, senile angiomas, or Campbell de Morgan spots, cherry angiomas can range in color from bright red to purple and are made up of clusters of tiny capillaries at the surface of the skin. When they first develop, they are often only 0.1 mm in diameter and almost flat, but they can grow to over 1 cm across and become raised and dome shaped. If injured, a cherry angioma may bleed profusely. The Nd:YAG laser emits infrared light that operates in both pulsed and continuous mode. It is used for laser-induced thermotherapy, in which the laser ablates the targeted lesions. The Pulsed Dye Laser delivers a concentrated beam of light that heats and damages the affected blood vessels without harming the surrounding skin. Treatment takes just a few minutes to complete and requires no downtime. The body will then naturally remove the damaged vessels within a few weeks. Cysts are painless pockets of tissue that contain fluid, pus, or air and can develop on any area of the body. They often feel like a small bump beneath the surface of the skin and grow slowly over time. If they become infected or rupture, they may cause pain. Most cysts do not disappear on their own and require treatment to remove. A corticosteroid is injected directly into the affected area to suppress inflammation. An incision is made into the cyst and the contents are drained. This hard, round nodule is usually 0.5 to 1 cm across and brownish or tan in color. Although not generally painful, a dermatofibroma may be itchy and tender. The cause of dermatofibromas is unknown, and they occur most often in women. 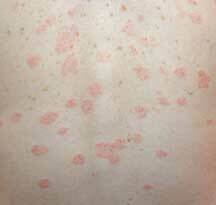 Eczema (atopic dermatitis) is a condition that makes your skin red and itchy. It’s common in children but can occur at any age. 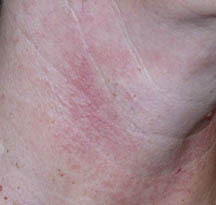 Eczema is long lasting (chronic) and tends to flare periodically and then subside. It may be accompanied by asthma or hay fever. There is currently no cure for atopic dermatitis, but treatments and self-care measures can relieve itching and prevent new outbreaks. For example, it is important to avoid harsh soaps and other irritants, apply medicated creams or ointments, and moisturize your skin. We offer a range of topical treatments for eczema, and we can help determine the right treatment for you. One or more treatments can be combined for optimal results. Topical steroids are commonly used to treat eczema flare-ups by reducing redness, itching, and inflammation, and they allow the skin to heal. Immunomodulation therapies such as cyclosporine, azathioprine, and mycophenolate mofetil elicit an immune response from the body to treat eczema and its symptoms. 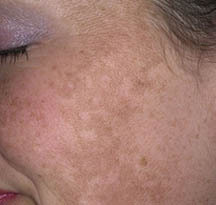 Freckles, also known as ephelides, are clusters of concentrated melanin that appear as flat light brown or red spots. Having freckles is genetic, and they are often found in people with a fair complexion and blonde or red hair. Freckles are benign, and they can become darker and more numerous with sun exposure. What Is Hair Loss and Hair Abnormalities? Hair loss can occur for a variety of reasons, such as heredity, hormonal changes, aging, and medical conditions. It often develops gradually over time and results in thin hair, a receding hairline, or baldness. Options for hair loss secondary to hormonal changes include finasteride (PROSCAR®) for men and spironolactone (Aldactone) for women. We offer a range of topical treatments to treat hair loss and hair abnormalities, and we can help determine the right treatment for you. One or more treatments can be combined for optimal results. A corticosteroid is injected directly into the affected area to suppress inflammation and promote hair growth. A hemangioma is a benign vascular tumor filled with blood that may appear as a bright red “strawberry” on the surface of the skin or as a bluish swelling just under the skin. 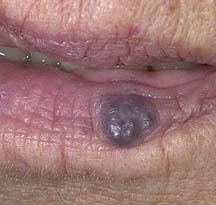 Steroids are commonly used to treat hemangiomas. Beta blockers are thought to inhibit the growth of hemangiomas by causing vasoconstriction, apoptosis, and the regeneration of the endothelial lining of the blood vessel. Hirsutism is excessive hair growth in women in areas where mature hair is usually minimal or absent. High levels of insulin are thought to stimulate the ovarian theca cells to produce androgens (male hormones), and an increased level of androgens in the body or an oversensitivity of hair follicles to androgens can lead to hirsutism. Additional studies may be helpful in order to identify an underlying hormonal imbalance. We offer a range of topical treatments to treat excessive hair growth, and we can help determine the right treatment for you. One or more treatments can be combined for optimal results. Hyperhidrosis is excessive sweating that may occur even without sweat-inducing conditions such as heat or exertion. This condition often causes so much sweating that it soaks into clothing or drips off the hands. As a result, many people are embarrassed or have social anxiety. BOTOX® is injected to block the nerve communications to the area and prevent them from stimulating the sweat glands. Smartlipo™ laser is used to permanently ablate the sweat glands in the armpits. We offer a range of topical treatments to treat excessive sweating, and we can help determine the right treatment for you. One or more treatments can be combined for optimal results. Robinul (glycopyrrolate) may be used to suppress hyperhidrosis. 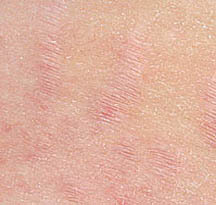 These red, raised scars do not grow beyond the boundaries of the original wound and are due to an overproduction of collagen during the wound’s healing. Although they will never completely resolve on their own, they do tend to improve over the course of years. The CryoShape™ hand-held device inserts a small needle into the scar to deliver extremely cold temperatures and destroy the deep tissue from the inside out. A single treatment can significantly reduce scar volume while softening and normalizing collagen within and around the scar. Hypopigmentation is lightening of the skin caused by a loss of melanocytes or a decrease in tyrosine (an amino acid used by melanocytes to make melanin) in the skin. Hypopigmentation may be due to chronic sun exposure, damage from a laser procedure, infection, autoimmune disease, or rarely, cutaneous lymphoma. Immunomodulation therapies elicit an immune response from the body to treat hypopigmentation and its symptoms. 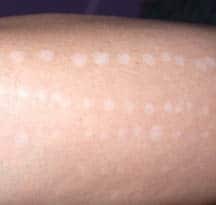 Topical steroids are commonly used to treat hypopigmentation. Keloids are firm, rubbery lesions that can range from pink to flesh colored or red to dark brown. They may be itchy, change in texture, and, in some cases, cause sharp pain. Keloids result from an overgrowth of connective tissue during wound healing that grows beyond the boundaries of the original wound. Unlike hypertrophic scars, they are unlikely to improve naturally with time. Microdermabrasion removes the outermost layer of skin cells, ridding the complexion of bumps, dullness, and other imperfections to provide improved skin tone and texture. For our microdermabrasion treatment, we use the DiamondTome™ Skin Resurfacing System. The patented diamond-tipped wand and custom vacuum settings ensure the appropriate amount of exfoliation for each patient, and treatment is quick and requires no recovery time. We offer a range of topical treatments for keratosis pilaris, we can help determine the right treatment for you. One or more treatments can be combined for optimal results. Melanoma is a serious type of skin cancer that develops in the cells that produce melanin, often in areas that have had a lot of sun exposure. We offer Aldera™ as a topical adjuvent treatment for certain cases of melanoma. 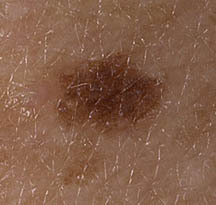 For melanoma in-situ (early stage of melanoma). 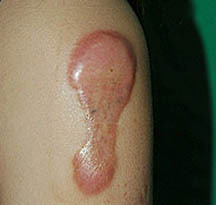 A skin-sparing procedure in which small margin of tissue is taken around the lesion. This tissue is processed and examined under the microscope to ensure clear margins before closing the incision. Melasma is a skin condition characterized by dark, patchy areas of facial skin caused by UV exposure. It is thought to be most common in women because high estrogen levels can cause increased melanin production when the skin is exposed to the sun. We offer a range of topical treatments for melasma, and we can help determine the right treatment for you. One or more treatments can be combined for optimal results. 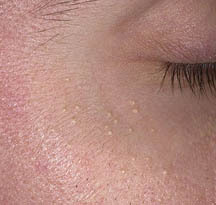 Milia are characterized by cystic collections of keratin (a fibrous structural protein) just under the skin’s surface. 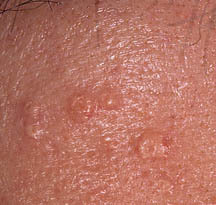 They appear in clusters of small white or yellow raised bumps and are common in women and newborns. They sometimes result from harsh face washes or repeated heat stress, such as hot showers, on sensitive skin. A small, sterile needle or blade is used to nick the milium, and pressure is applied to remove the contents. This treatment provides beautiful, healthy-looking results without any scarring. Nail disorders are conditions that affect the color, shape, texture, or thickness of the fingernails or toenails. Beau’s lines, koilonychia (abnormal fingernail shape), onycholysis (nail lifting), and leukonychia (white streaks or spots) are among the most common nail disorders. We offer a range of oral treatments for nail disorders, and we can help determine the right treatment for you. One or more treatments can be combined for optimal results. We offer a range of topical treatments for nail disorders, and we can help determine the right treatment for you. One or more treatments can be combined for optimal results. Conditions such as eczema, molluscum, warts, acne, moles, psoriasis, pityriasis rosea, other unusual skin conditions in infants, children, and adolescents can be treated. We offer a wide-range of treatments depending on the specific pediatric condition, and we can help determine the right treatment for you. One or more treatments can be combined for optimal results. Poikiloderma is a benign condition characterized by a combination of textural changes, dilated capillaries, and darkened pigmentation on the neck. It is caused by chronic sun exposure and affects mostly women. What Is a Port-Wine Stain? 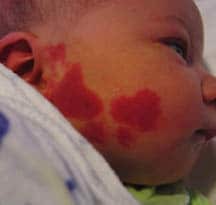 A port-wine stain is a red/purple birthmark caused by the malformation of capillaries (tiny blood vessels) in the affected area of skin. Infants’ and children’s port-wine stains are usually flat and light in color, but they generally darken and become thicker as they mature. Small disfiguring lumps may also develop. Pseudofolliculitis barbae (PFB) is caused by persistent inflammation of ingrown hairs that result from shaving. It is most common in areas shaved that have tight, curly hair because the hairs tend to get trapped in the follicles. 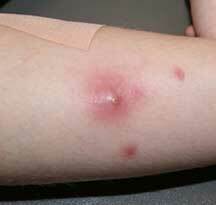 PFB usually presents as red bumps or infected pustules. 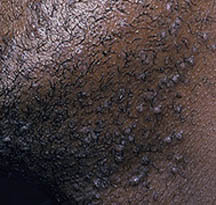 It is most common in African-American men and, if left untreated, can develop into keloid scarring. We offer a range of topical treatments for pseudofolliculitis barbae, and we can help determine the right treatment for you. One or more treatments can be combined for optimal results. Psoriasis is a common inflammatory skin condition that changes the life cycle of skin cells. Psoriasis causes cells to build up rapidly on the surface of the skin. The extra skin cells form thick, silvery scales and itchy, dry, red patches that are sometimes painful. Psoriasis is a persistent, long-lasting (chronic) disease. There may be times when your psoriasis symptoms get better alternating with times your psoriasis worsens. Psoriasis may also affect the joints. We offer a range of topical treatments for psoriasis, and we can help determine the right treatment for you. One or more treatments can be combined for optimal results. 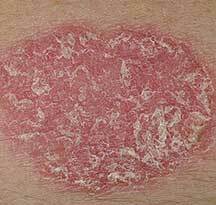 Systemic treatment options for psoriasis include HUMIRA®, ENBREL®, STELARA®, Otezla®, Talz®, SORIATANE® (acetretin), and methotrexate. What Is a Pyogenic Granuloma? A pyogenic granuloma is a common skin growth that presents as a small, red, oozing, and (sometimes) bleeding bump. It grows rapidly over a period of weeks to an average size of 0.5 inches. Pyogenic granulomas usually occur on the head, neck, upper trunk, hands, and feet. A high-frequency alternating electric current is applied to ablate the lesion. Rashes are conditions that affect the color, appearance, and/or texture of the skin. We diagnose and treat a wide variety of rashes. We offer a range of oral treatments for rashes, and we can help determine the right treatment for you. One or more treatments can be combined for optimal results. We offer a range of topical treatments for rashes, and we can help determine the right treatment for you. One or more treatments can be combined for optimal results. 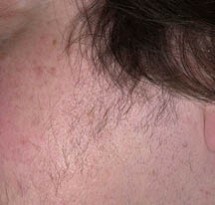 Rhinophyma is an uncommon form of rosacea that results in knobby bumps on the nose and cheeks. Rhinophyma can make the nose and face look swollen. The changes in the face caused by rhinophyma may become permanent. Oral antibiotics may decrease inflammation within the sebaceous glands to provide a smoother appearance with fewer papules and/or pustules. Rosacea is a common skin condition that causes redness in the cheeks, nose, and chin. This condition usually becomes more noticeable after 30 years of age and is marked by facial flushing that continues to grow worse over the decades. Rosacea is hereditary and exacerbated by UV radiation. Oral antibiotics may decrease inflammation within the sebaceous glands to improve the skin’s appearance. We offer a range of topical treatments for rosacea, including METROGEL®, Finacea®, Soolantra®, and MIRVASO®, and we can help determine the right treatment for you. One or more treatments can be combined for optimal results. Scars are created when the dermis becomes damaged and the body sends collagen fibers to repair the site of injury. The resulting build up of collagen produces tissue that is a different texture than that around it. Most scars originally appear red or purple but fade over time. Acne scarring results from the presence of too much collagen during healing (raised scarring) or too little collagen (pitted scarring). Platelet Rich Plasma (PRP) has many growth factors, which stimulate wound healing and collagen production. Scar subcision is often used for deep acne scars. A needle is oscillated beneath the scarred area to fragment the scar tissue and release the skin from indentation. 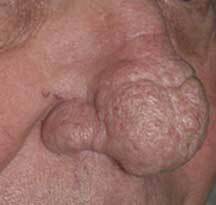 Sebaceous hyperplasia is characterized by 1 or more small, yellowish, soft papules over the nose, cheeks, and forehead. It is a benign condition of sebaceous glands in middle-aged adults and older. Sebocytes (sebaceous cells) overcrowd the sebaceous gland, causing its enlargement that results in hyperplasia. 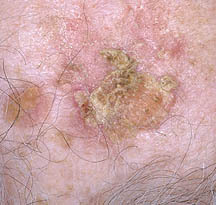 Sebaceous hyperplasia lesions produce very little sebum. A high-frequency alternating electric current is applied to break up the scar tissue. 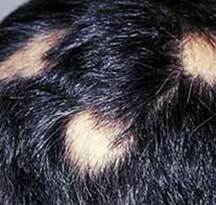 Seborrheic dermatitis is a common skin condition that mainly affects the scalp. It causes scaly patches, red skin, and stubborn dandruff. 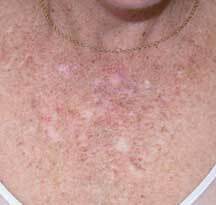 Seborrheic dermatitis can also affect oily areas of the body, such as the face, upper chest, and back. Seborrheic dermatitis doesn’t affect your overall health, but it can be uncomfortable and cause embarrassment. It isn’t contagious, and it’s not a sign of poor personal hygiene. Seborrheic dermatitis is usually a long-term condition. You may need many repeated treatments before the symptoms go away, and they may return later. You may be able to manage flare-ups by recognizing seborrheic dermatitis symptoms and using a combination of self-care steps and medications. Seborrheic dermatitis is also called dandruff (when it involves the scalp in adults), cradle cap (in infants), or sebo-psoriasis. We offer a range of topical treatments for seborrheic dermatitis, and we can help determine the right treatment for you. One or more treatments can be combined for optimal results. Seborrheic keratosis is a common benign skin growth that can range in color from light tan to black and can also greatly range in size. 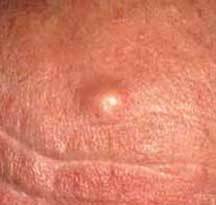 These growths can be round or oval and are often slightly elevated, and they usually appear on the face, chest, shoulders, or back. We generally obtain a bacterial culture of the affected areas to confirm the type of bacteria causing the skin infection and its antimicrobial sensitivities. Oral antibiotics are prescribed to fight off the bacteria that are causing the skin infection. Topical antibiotics are prescribed to be applied to the skin infection and kill the infection-causing bacteria. 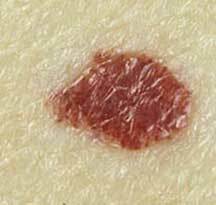 Skin lesions encompass all superficial growths or patches of skin that do not resemble the surrounding area, and they may be benign (non-cancerous) or cancerous. 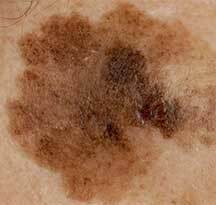 Moles and other skin lesions may change over time. There are certain changes that could be signs of cancerous or precancerous cells, and early detection is important for addressing potential problems. Therefore, it is imperative to have any skin lesion of concern evaluated by a dermatologist. If you’re concerned about an abnormal spot, mole, or any other skin lesion, come in for an evaluation and simple, in-office skin biopsy. Depending upon the results of the biopsy, the lesion may be treated with one of the following procedures: Mohs micrographic surgery should be employed, during which the tissue is removed and examined to determine whether additional tissue removal is needed. We offer a range of topical treatments to treat different skin lesions, and we can help determine the right treatment for you. One or more treatments can be combined for optimal results. Following use of numbing medicine, the lesion is surgically removed and sent to the lab for processing and evaluation. Spider veins, also known as reticular veins, are vessels that appear red, purple, or blue and span greater than 1 mm. They can occur anywhere on the body and are usually caused by heredity, excessive standing, obesity, hormonal influences, and any condition that causes increased pressure on the abdomen, trauma, or exposure to UV radiation. Sclerotherapy treatment involves the injection of a sclerosing solution into the unsightly veins. The solution makes the vein walls sticky, which causes them to close. The body will then naturally eliminate the treated vessels during the next few weeks. Squamous cell carcinoma (SCC) is the second most common form of skin cancer, and UV radiation has been shown to significantly promote its development. Although it is does not grow rapidly, it can spread to nearby bones and tissues and become difficult to treat. We offer 5-Fluorouracil (Efudex® and Carac®) as a topical treatment. This antimetabolite works topically to kill the cancer cells. Stretch marks are a form of scarring as a result of rapid stretching of the skin. They first appear as reddish or purple lines but gradually fade to a lighter color over time. They can occur anywhere on the body but are most common on areas that store large amounts of fat. We offer a range of topical treatments for stretch marks, and we can help determine the right treatment for you. One or more treatments can be combined for optimal results. Sturge-Weber Syndrome is an extremely rare congenital disorder that involves the skin and neurological system. It is often associated with port-wine stains of the face, glaucoma, seizures, mental retardation, and ipsilateral leptomeningeal angioma. The sun’s ultraviolet (UV) rays damage the elastin and collagen in the skin, causing it sag and lose its elasticity. As a result, the skin ages prematurely, causing the development of fine lines, wrinkles, sun spots, discolorations, and textural changes. In addition to premature aging of the skin, sun damage can also lead to the development of skin cancer. Vitamin A derivatives such as retinol stimulate collagen production and increase cell turnover. Products with antioxidants including vitamin C and E help to fight skin damage caused by free radicals that are formed from inflammation from sun exposure, smoking, and alcohol. Proteins that help promote the skin’s natural ability to repair sun damage. 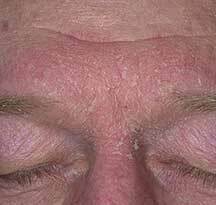 Sun spots, also called solar lentigo, are hyperpigmented, flat, smooth lesions that are seen but cannot be felt. They occasionally resemble moles and are usually light tan to brown in color. Sun spots develop most commonly on Caucasians who are 20 years of age or older and occur on the sun-exposed skin of the face, neck, chest, forearms, and hands. Sun spots should be monitored for changes in growth, color, or surface contour because these changes can be indicative of skin cancer formation. A sunburn is a tissue burn caused by the overexposure of UV radiation which causes direct DNA damage and increased melanin production. 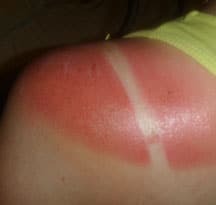 It is usually marked by red skin that is hot to the touch and tender. The excess exposure to UV radiation can lead to basal cell and squamous cell carcinoma. To protect your skin from the harmful ultraviolet rays of the sun, wear a broad-spectrum sunscreen with an sun protection factor (SPF) of 30 or higher every day. We offer a range of topical treatments for sunburns, and we can help determine the right treatment for you. One or more treatments can be combined for optimal results. 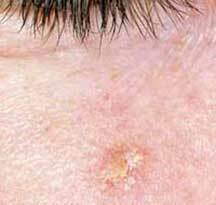 A syringoma is marked by skin-colored or yellowish, firm, rounded bumps usually 1 to 3 mm in diameter clustered on the eyelids. It is caused by benign sweat duct tumors located in the superficial dermis. 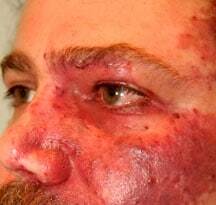 Telangiectasia are veins less than 1 mm in diameter that appear red, purple, and blue. They are usually located on the face or legs. Factors that can lead to telangiectasia include genetics and sun exposure. 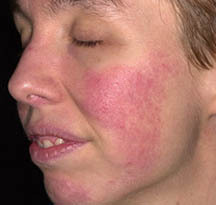 Telangiectasia is often linked with rosacea. Varicose veins are large, unsightly veins that protrude from the skin and can cause aching, pain, and restless leg syndrome. They are caused by broken valves in the vein that allow the backflow of blood, which pools in the vein and causes its enlargement. Varicose veins most commonly occur in the legs, but they can occur in other areas of the body as well. EVLA vein removal treatment involves the insertion of a small laser into the affected vein(s), which safely closes the vein so it can be naturally absorbed by the body. This procedure involves a series of tiny stab incisions to remove portions of the varicose vein. A minimally invasive procedure that uses radiofrequency to heat, collapse, and seal off the affected blood vessel. What Is a Venous Lake? A venous lake appears as an asymptomatic, soft, compressible, dark blue papule usually 0.2 to 1 cm in size. They are usually found on the sun-exposed surfaces of the lips, face, and ears. 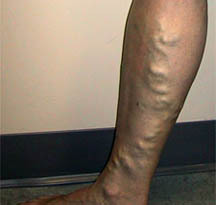 Venous lakes are a form of vascular dilatation that is believed to be exacerbated by sun exposure and damage. Vitiligo is a skin disease that causes loss of skin pigment and results in irregular pale patches of skin. It typically appears in skin folds, on the extremities, and on the face and neck. 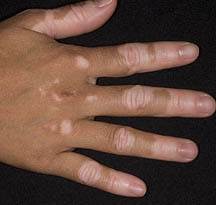 Vitiligo normally develops before the age of 20 and is caused by a combination of environmental and genetic factors. After microdermabrasion treatment is performed, topical psoralen is applied to the skin to make the cells sensitive to certain wavelengths of light. In one to three hours, the psoralen is washed off, and then the skin is treated with either Intense Pulse Light or the Pulsed Dye Laser. We offer a range of topical treatments for vitiligo, and we can help determine the right treatment for you. One or more treatments can be combined for optimal results. Warts generally appear as small, rough tumors located on the hands and feet and can often be mistaken for a blister. They will disappear and reappear periodically. Warts are caused by an infection of the human papillomavirus (HPV) and are contagious through skin-to-skin contact. Otherwise known as “beetle juice,” this topical agent causes a blister to form in the area of the wart. Wrinkles are lines, furrows, folds, and creases in the skin due to aging, sun damage, and a loss of collagen and elastin in the skin. 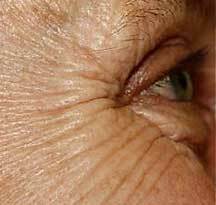 Wrinkles are especially noticeable on the face in areas such as across the forehead, between the eyebrows (“frown lines”), at the outer corners of the eyes (“crow’s feet”), and around the mouth (“smile lines,” “marionette lines,” and “smoker’s lines”). BOTOX® Cosmetic is an injectable neurotoxin that temporarily relaxes the muscles that causes facial movements like frowning and squinting. BOTOX® Cosmetic is FDA approved to treat moderate to severe frown lines between the eyebrows and crow’s feet. Injectable fillers made of hyaluronic acid, including JUVÉDERM® and Restylane®, quickly and effectively smooth away fine lines and wrinkles. Don't see what you're looking for? Please contact Colorado Skin & Vein to schedule your consultation today!